On a rainy spring day, a young boy comes home hoping that this will be the Big Night. After dinner, the boy gets his raincoat on and a flashlight covered in pink plastic to lessen the glare. He and his parents head out to the wet road in the dark. In the dark and the rain, the family help salamanders cross the road safely as they move from forest to pond to lay their eggs. But some of the cars are going so fast that it is dangerous not only for the salamanders. So the boy creates a sign that says “Go Slow, Salamander Crossing!” It is indeed a Big Night. The story of the boy is presented side-by-side with information on what the salamanders are doing. Readers get insight into the animals, told in a much more poetic and flowing way than the human story. It makes for a lovely contrast with one another where not just the font and the content tell the different stories but also the tone and writing style. Benioff’s illustrations are equally at home with the humans and the salamanders. It is a pleasure seeing a child of color in a story where there is no mention of it at all. 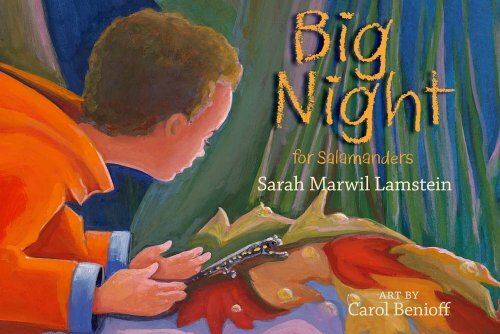 Her art is bold enough to work with groups, and this book as a whole is ideal for reading aloud in storytimes about spring or salamanders. All children will reach the end of the book wishing that they too could shepherd salamanders across a road at night. A lovely science story book, this book successfully marries science into a picture book story. Appropriate for ages 4-6. Thank you for your wonderful review, Tasha!